Thank you for your email. I attended your meeting, and found it extremely helpful to hear the views of local residents about this development proposal. I was a little surprised to read the comment on your website that the Shaftesbury Ward councillors have not been responding to local residents’ concerns about the application. I am not sure how you drew this conclusion because, as far as I am aware, my colleagues and I have responded to all the emails and letters we have received from concerned residents. As local residents ourselves we do have our personal opinions about the scheme, but I know you are aware that as councillors we have to be extremely careful about making our views publicly known before the matter is determined. I have checked my inbox, and the only emails I can find from you are the ones you sent to the Leader of the Council, which were copied to the other 59 councillors. Whilst I did, of course, read your comments carefully I assumed these were sent for information, and did not acknowledge them as I did not think there was any more I could add to Cllr Lister’s replies. If, however, you have written to me as your local councillor and not received a reply please accept my apologies for the oversight. Perhaps you would be kind enough to re-send your email and I will be pleased to assist you in any way I can. First I thank you for your email. I am pleased to know that you were indeed in the room on Wednesday. I must apology if my comment about your silence was actually showing reserve. However I must welcome today the fact that you found eventually a way to raise your voice and show your concern. I have no doubt that you know that the planning proposal will affect primarily three wards: Latchmere, Northcote and Shaftesbury. Early at the beginning of our campaign we had the occasion to hear from your Conservative Colleagues in Northcote ward, as Cllrs Johnson, Beddows and Dawson published in the Wandsworth Borough News of the 19th November 2008 a call to encourage residents to ensure that their views are submitted to the Council so that the Planning committee is fully aware of their views and comment when the application is considered. We relayed the article in a post here. I can only assume that you thought that Shaftesbury constituents did not need additional information. Later, in December, I wrote to all the Councillors about our meeting organised in January. My email was sent on the 22nd December, and starts with “Dear Councillors, You will find attached the latest leaflet of the Clapham Junction Action Group […]“. I received a nice response from Cllr Philip Beddows on the same day, telling me he intends to be at the meeting, copying his two colleagues from Northcote Road. Later in this same evening, I received another email from Cllr Peter Dawson, confirming that the date of the public meeting was in his diary and questioning the impression we gave on the position of the Council. I had the occasion to answer here. In this response, my third point was actually directed toward the Councillors of Shaftesbury Ward and I can only assume again that you missed it. Regarding Latchmere ward, Tony Belton contacted me on the 14th November, spontaneously after receiving my leaflet, and we met later, after exchanging several emails. And on the same day of December when I received emails from the Councillors of Northcote ward, Cllr Leonie Cooper contacted me offering her help. In addition, you must know that, albeit fully aware of the need for the members of the Planning Committee not to pre-determine the decision, I asked the majority of the Council to provide a speaker to answer general queries about the plan. 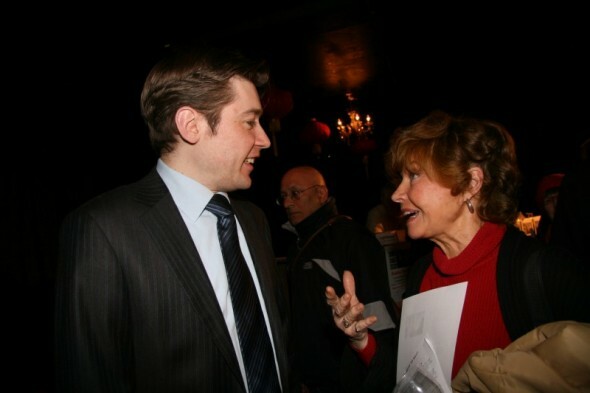 In a recent post, I – again – regretted the silence of the Councillors of Shaftesbury ward. Last but not least, as you were attending the Public Meeting on Wednesday, I am surprise you did not hear that I specifically regretted the silence of the Councillors of Shaftesbury ward (if you missed that part, I will email you personally when the video will be on the website, pointing at the very fine moment) and discovered it only on my report here. 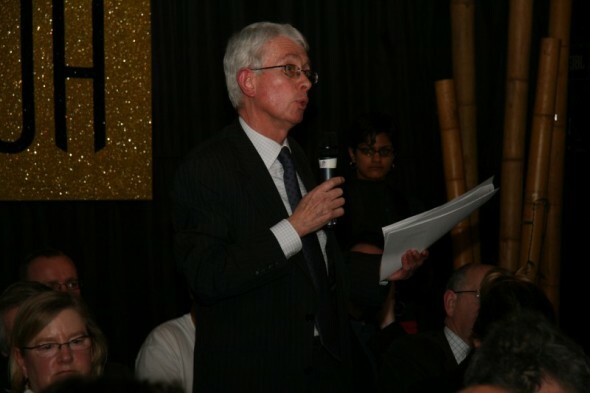 I encouraged Councillors to address the public: I heard Tony Belton, from Latchmere ward. I heard all the three Councillors of Northcote ward talking one after another. I did not hear you. Feel absolutely free to add your comment to this post. Additionally, would you like us to publish a separate response, just send it to me by email. Many thanks for this email and the attached link which I found very interesting. I do, however, have to take issue with your comment about the Shaftesbury councillors which isn’t terribly constructive. After reading it I have checked through correspondence I have received and have answered all the messages I received on this subject. Obviously these were messages from residents who are not part of your group, or who have not brought my responses to your attention. I do not recall receiving any direct correspondence about the application that I have not responded to, and I have not been able to find any correspondence directed to me that has not had an answer. I note there were several messages from you to the council leader on which I, and my colleagues, were cc recipients. My understanding (and I believe the usual email etiquette) is that cc recipients are copied for information, rather than response. When it comes to mass-mailings to councillors it is usual practice that one councillor, in this case it was the Leader, will respond on behalf of all recipients. If you were expecting individual responses I can only apologise for the misunderstanding. Unfortunately a prior engagement meant I could not attend your public meeting. In any event, as you know, councillors are not able to comment on live planning applications as this might result in pre-determination, so even if I had been able to attend I do not think I could have added anything constructive that my council colleagues did not cover. I, and my ward colleagues, are following the progress of the application closely and can assure that just because we have not corresponded directly with you on the matter does not mean we are in anyway absent. I refer to my response addressed to Cllr Ellis regarding some of the points raised in your letter. I welcome your email, albeit not agreeing on your comment about not being “terribly constructive”. The fact that I received two emails within a few hours after several months of campaigning shows a result. In addition, I must correct your statement “In any event, as you know, councillors are not able to comment on live planning applications as this might result in pre-determination“. If you only needed an example, the fact that your colleagues, some of them even member of the Planning Committee, addressed the audience, shows that you are wrong to assume that your role as a councillor is to remain silent. After the public meeting held on Wednesday 29th January, below is a report from the South London Press published today (I was told that more will come in the following weeks). Yesterday we held our public meeting at the Wessex House from 7pm to 9pm. Tony Tuck told us about the role of the Battersea Society in this debate. 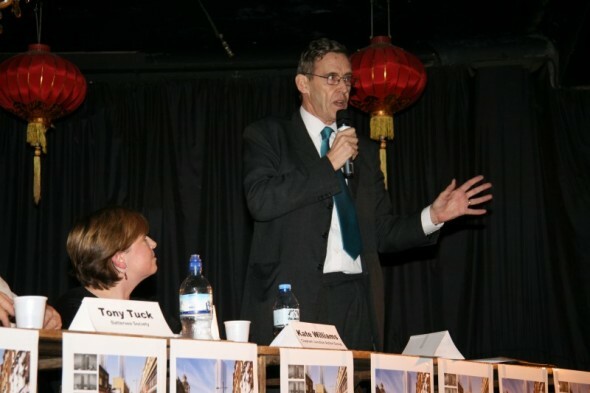 He highlighted the response of the Society to the proposals for a redevelopment of Clapham Junction Station, questioned the lack of affordable housing, the design of the towers (quoting CABE’s comments) and stressed the urgent need for an overall vision for Battersea Town Centre, including the need of a global policy on tall buildings in Wandsworth. 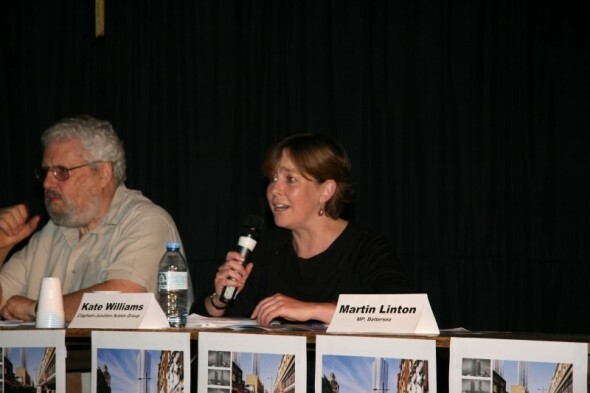 Kate Williams, on behalf of the Clapham Junction Action Group, focused on the comments made by the local residents, with some of the 400 letters and emails sent to the Council. We had a bit of a laugh when she told us about the number of support messages sent from the same email address, coincidently working, apparently, for a communication agency (I heard some “name and shame” from the public 😉 ). 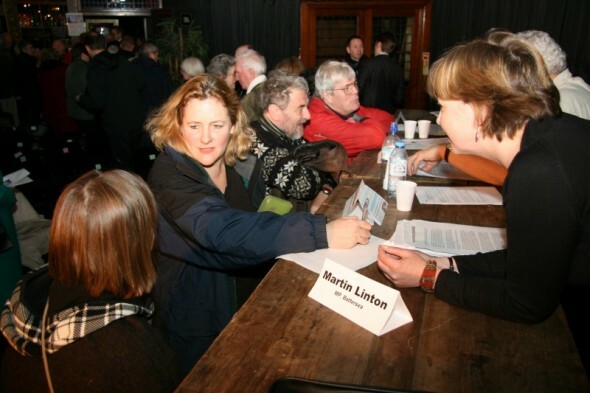 She highlighted the importance for the residents to write to the Council and send their views (there is no specific target on the number of letters, but one of the reasons for the acceptance of the Ram Brewery project was the lack of comments, and the more than 500 objections for the project in Putney played an important role in the Planning Committee’s decision to reject the proposal). Always remember that every single voice counts, so it is important that people write personally instead of sending a group objection. Martin Linton, our MP for Battersea, who joined us immediately after attending an important vote on the 3rd runway in Heathrow in Westminster, spoke about the role of the government, spending £9 million on the installation of lifts to make the station step-free by the end of 2009, and the commitment of Network Rail to provide a budget for station improvements (reopening of Brighton Yard, complete with gate-line and ticketing facilities, to complement the lifts and the straightening and lengthening of platforms). 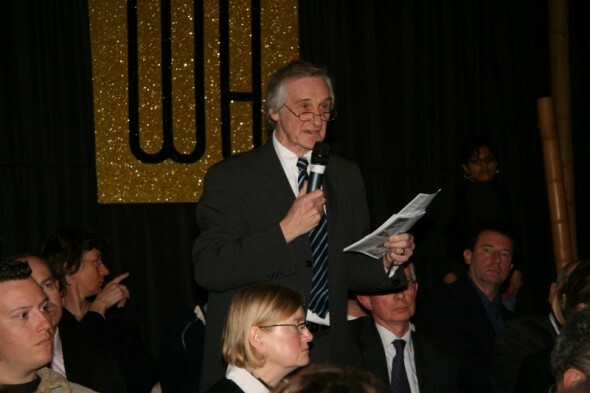 He also expressed his concerns about the lack of affordable housing and his desire, along with that of the other Societies in Wandsworth, for a global policy on tall buildings in the Borough. 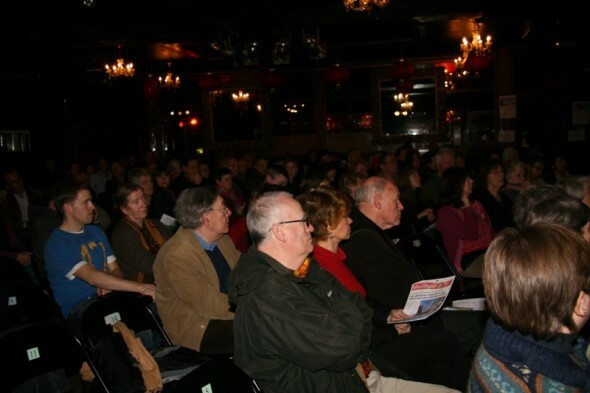 Other participants talked about their concern for the buildings which will be destroyed by the scheme, such as The Windsor Castle, the issue of insufficient parking spaces, the support of the Mayor of London (Boris Johnson’s office declared that “the towers would be attractive city elements contributing to London’s skyline“) despite minor comments, the size of the 500 new flats, etc. 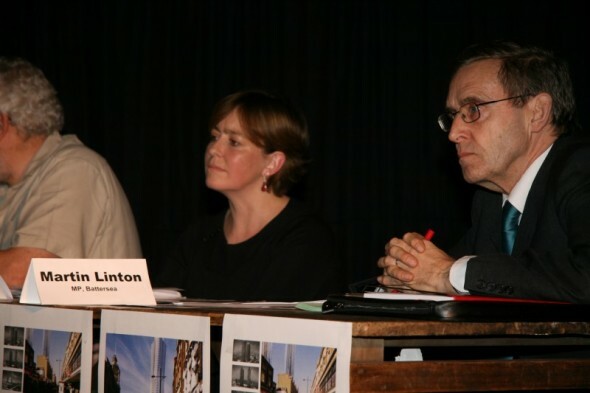 All three of the Councillors of Northcote ward added their comments and acknowledged the concerns of their constituents. 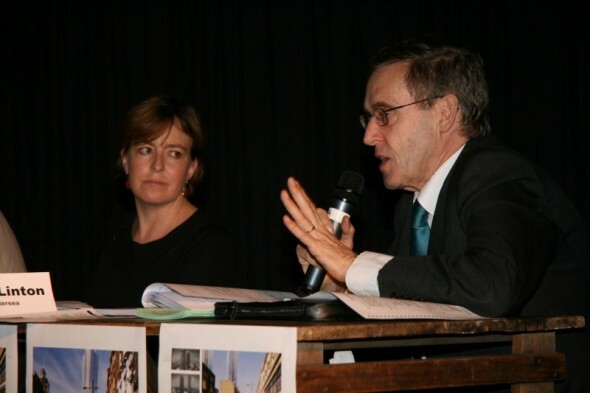 Peter Dawson referred to the decision on the Putney Towers as very important, because it gives the key grounds on which such a planning application could be refused, and suggested to careful reading of the report published. There was no news of the Councillors in Shaftesbury ward (someone confirmed to me that despite appearances, they really exist!). We finished the meeting after 2 hours, by 9pm. I would like once again to thank all of the participants, especially those on the platform with us: Martin Linton, who rushed from Parliament to join us, Tony Tuck and the Battersea Society (with their secretary, Harvey Heath). I won’t forget Wendy Deakins, who helped with the organisation of the venue, and Peter Deakins, who displayed drawings to show alternative developments of the area. 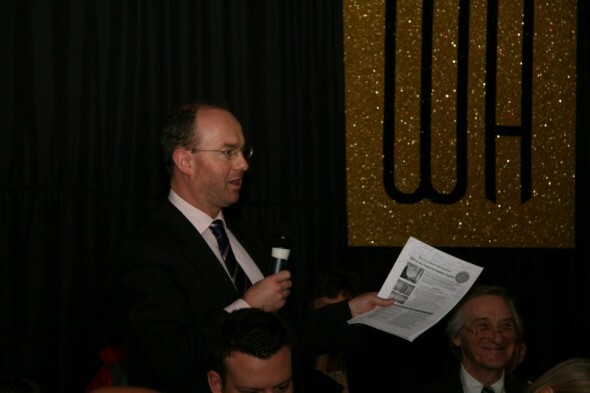 Pamela Price provided wonderful Wessex House, with lighting from Phil (Lolli Parties) and Darren for the sound (SLR). A photographic record of the event was taken by Chrysoulla Rosling and video (coming soon on this website) was recorded by Pierre-Phillipe Ravier. Bindu Joshi was a great hand with the microphone amongst the public. Thanks also for all of the help we had, in the Clapham Action Group, from you, distributing leaflets and helping where needed, from all of you who attended the meeting, and from you too for reading this website. Last but not least, special thanks for Tony Belton who spontaneously asked for some donation from the public to help fund the meeting. Stay with us, it’s not over: we have just received a leaflet from Metro Shopping this morning advertising their proposal! The Planning Applications Committee will be meeting either for the 12th of March or later. 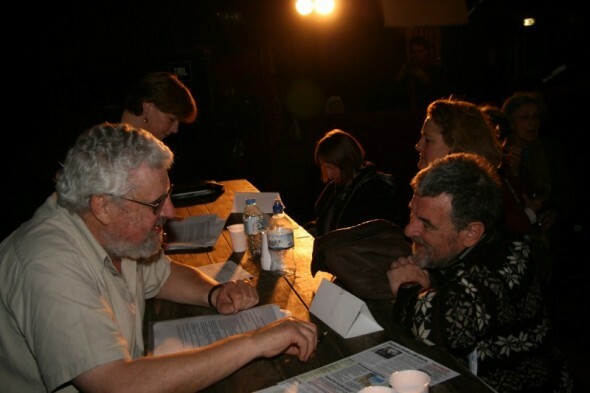 As Tony Tuck emailed me today: “If people get to that meeting in sufficient numbers to cause a move into he Council Chamber then I think it will not only be a powerful psychological factor, but a great eye opener for those people in “the public realm”, as I put it last night, who have not seen local democracy in action.“. You can be sure that the Clapham Junction Action Group will join the efforts of the Battersea Society on that aim. I know that you have been contacted by the Battersea Society to attend the meeting. However, I would like to reiterate our invitation to have a speaker representing either Delancey, or the Metro Shopping Fund to speak at the meeting. 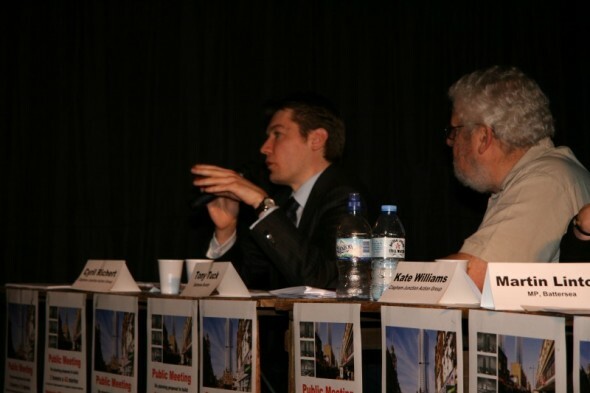 I think it would be very positive to present your view, maybe to explain the purpose and advantages of the development, and to have the opportunity to answer the concerns of the public and express your view of Clapham Junction future in the debate. As you may know there is currently a wide debate about the opportunity of the current Clapham Junction redevelopment proposal. I think it would be very positive to present your view, maybe to explain the purpose and advantages of the development, and to have the opportunity to answer the concerns of the public and express your view of general rail policy and investment in the debate. Thank you again for your email. I have spoken with the relevant colleagues from both our commercial property and operations team and on this occasion we are unable to attend tomorrow’s Battersea Society event. We are currently liaising very closely will the LB Wandsworth regarding the proposed transport improvement works at Clapham Junction. We have recently received a letter from the Council asking us to respond to some very specific points which we believe have been raised through the planning consultation. We expect these to cover many of the key concerns raised by the local community. May I suggest you speak with your ward councillors or the relevant officers for further details. If you have any further queries resulting from the meeting, may I suggest you raise them through the planning process. I understand that you have other engagements and regrettably won’t be able to attend the Public Meeting on the 28th January. However, it would be very positive to have someone representing the Council of Wandsworth as a speaker (along with the Battersea MP, the Battersea Society and the Clapham Junction Action Group and maybe the Mayor of London’s office), maybe to give a broader view on the Wandsworth policy on tall buildings, the application process, or to talk about more general aspects of developments in the borough. It could be someone outside the planning Committee and not showing any specific “pre-determine” position but addressing the general concern of the public? Would any Councillor (part of the majority running Wandsworth Council), like to address the concerns of their constituents? I am sorry but it is just not possible for me to attend your meeting as I have another meeting that evening at the Town Hall which I cannot miss. The Council’s position is absolutely clear and was outlined in my earlier email to you. By all means please feel free to share that with everyone. A number of Councillors will of course be attending the meeting and listening to the debate. You should however please bear in mind that no Member of the Planning Committee can express an opinion otherwise it could be considered a pre-determination of the planning application and they would be unable to take part in the decision when the matter comes before the Planning Applications Committee for a decision. It could also give grounds to an appeal by the applicant. I think it would be very positive to have someone from the Mayor’s office as a speaker (along with the Battersea MP, the Battersea Society and the Clapham Junction Action Group), maybe to give a broader view on the GLA policy, or to talk about more general aspects of Boris Johnson’s policy on tall building/skyscrapers? Could you could help us and relay our call? In addition I asked Jane Ellison to relay the request as she might have contact in Boris’ office but no answer from her. No answer. I heard that Jane Ellison is now on holiday. On Thursday, January 15, the Wandsworth Guardian published the story about the threat from Delancey. You can read online here, on by clicking on the article below to make it bigger. 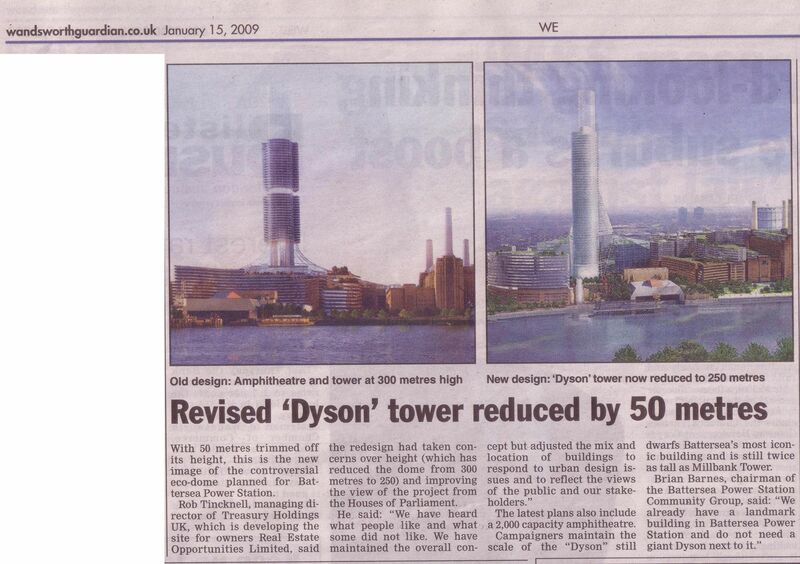 In addition, in the same issue of the Wandsworth Guardian, there was an article about the skyscraper project beside Battersea Power Station, that we were talking about last week. As usual, click on the article to make it bigger. Back in December, I wrote to Edward Lister, leader of the Wandsworth Council, about the policy of the borough for skyscrapers and high tower blocks. As a resident of Wandsworth borough, I would like to know the current position of the Council regarding the different projects of building skyscrapers in the Constituency. 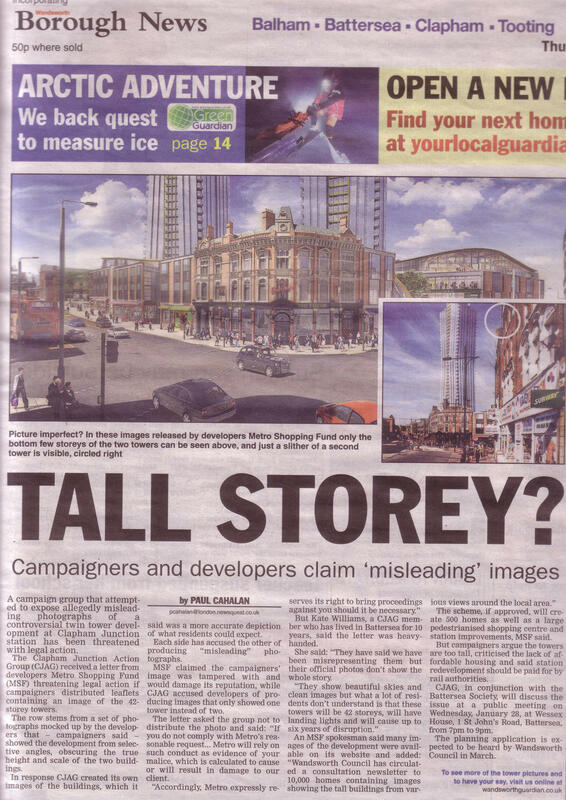 After the refusal of Putney’s project criticising the “inappropriate form, size, height, design, materials and appearance” and the acceptance of the 2 skyscrapers in the Ram Brewery development, the Council seems to present favourably (or at least without any guidelines) the project of tower blocks in Clapham Junction and Battersea. A recent comment given to a journalist of South London Press regarding Clapham Junction redevelopment said “A Wandsworth council spokesman said people’s views would be accepted until the application went to committee next spring and that the decision would be made solely on planning guidelines”. Could you please be more precise as to whether you favourably consider skyscrapers in the area? I am looking forward to your response and thank you in advance for any information given. Thank you for your e-mail of 29th December 2008 copied to other Councillors regarding your query as to the Council’s position on tall buildings. I feel it is more appropriate to use the term “tall buildings” rather than your suggested terminology of “skyscraper” as I consider this a more correct description of the buildings you are referring to. The Council’s policies relating to tall buildings can be found in our various planning policy documents. The most up-to-date of these is the Wandsworth Local Development Framework Core Strategy (Proposed Submission). This document takes into account the latest guidance from central government and the Mayor of London as well as extensive consultation on earlier stages leading to this document. You can view this on the Council’s web-site at www.wandsworth.gov.uk/planning. For your reference, the relevant section dealing with tall buildings can be found on page 88. Tall buildings, that is those which significantly exceed the prevailing height of surrounding buildings, can, if well designed, create attractive landmarks underlining aspects of the borough’s character and act as a catalyst for regeneration, providing they are located in appropriate locations and acceptable in terms of design and impact on their surroundings. They can be an efficient way of using land, in line with sustainability objectives, and add definition to the borough’s skyline, although it is important that they do not harm existing important views and skylines. Tall buildings and/or small clusters of tall buildings which can demonstrate these benefits may be justified in areas well served by public transport such as the town centres, particularly Clapham Junction, Wandsworth and Putney and at Nine Elms near Vauxhall and at focal points of activity. The primary policy dealing with tall buildings within the document is “Core Policy for Issues: Policy IS 3 – Good quality design and townscape”. Part ‘d’ of this policy specifically states that tall buildings “may be appropriate in locations which are well served by public transport, such as town centres and Nine Elms near Vauxhall, or at other defined focal points of activity, providing they can justify themselves in terms of the benefits they bring for regeneration, townscape and public realm”. The supporting text for this policy (paragraph 4.132) also sets out more detail of the Council’s view on tall buildings. Therefore in assessing the planning application for the recent scheme in Putney at 84-88 Upper Richmond Road which was refused by the Council on the 6th November 2008, it was considered that this did not meet the test of the tall buildings policy requirement. It should be noted that this was but one of a number of reasons why that particular application was refused. However, in the very different circumstances of the redevelopment of the Ram Brewery site, it was considered, along with many other factors, that this and other policy requirements were met. Wandsworth Town Centre is a town centre well served by public transport and the proposal overall offered significant benefits in terms of regeneration, townscape and public realm. Therefore it is not the case that the Council looks at tall buildings on a case-by-case basis although, of course, the specific circumstances and details of each individual case need to be taken into account. The relevant policy states the need to comply with a number of criteria including public transport provision, overall regeneration benefits in addition to townscape and public realm considerations. In my view, the Planning Applications Committee and the Council has been entirely consistent in its interpretation of the tall buildings policy: a policy which, I consider, is robust and allows the promotion of appropriate development. Regarding the current planning application at Clapham Junction Station which includes tall buildings amongst other proposals for improvements to the station and retail provision in the immediate area: this will be assessed in the same robust way as the previous applications your refer to in your e-mail. Once officers have analysed the consultation responses to date, plus sought the views of different sections within the Council and other consultees outside the Council, a report will be prepared and presented to the Planning Applications Committee. This will have a recommendation based on their professional judgement of compliance with a range of our planning policies and the merits of the scheme. However, it is a recommendation and the decision rests with the elected Member’s of this committee who will look in detail at the proposals, take account of policy and any representations made and debate the matter before reaching their conclusion. On occasion Committee members challenge aspects of the officer recommendation in order to come to the definitive conclusion. Officers are not yet in a position to indicate what their recommendation will be as more information and clarification is still required. The earliest date for the presentation of this report is likely to be the 12th March 2009 committee. 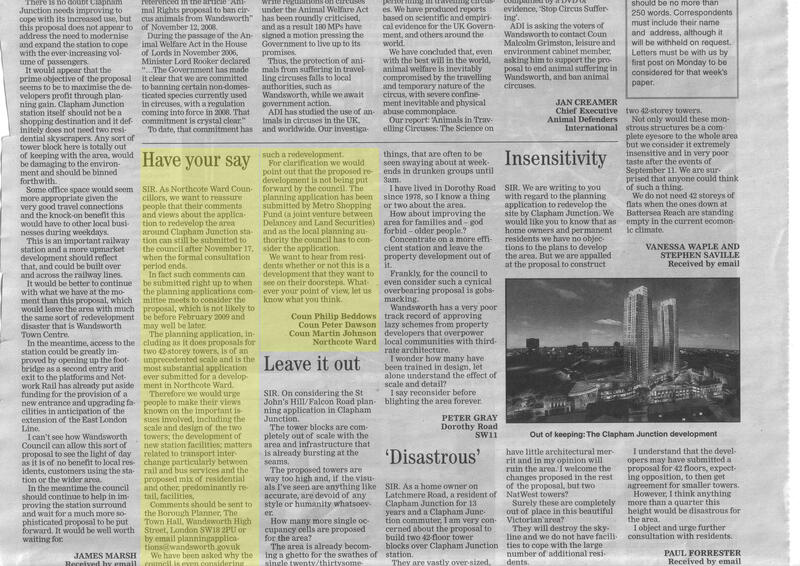 Finally, you asked for a comment made to the South London Press that any decision would be made “solely on planning guidelines”. This means that any decision will be based on the Council’s planning polices (which reflects central government and the Mayor of London guidance), the planning representations made and the planning merits of the scheme and not for any other reason. I should point out that government guidance stresses the importance of taking into account any views expressed by the public as part of the consultation process but this is not a referendum on the application. I hope that this addresses the concerns raised in your e-mail. First we need to agree on the definition of tall building. Are we talking about 15 storeys? 40? 50 meter high? 300 meters? The conservative Mayor was used to call them Ken’s “phallocratic towers” during his campaign. Are the same building called Boris’ “landmark for London” nowadays? The Commission for Architecture and the Built Environment (Cabe), the Government’s design watchdog, issued a warning commenting a recent submission to the Wandsworth Council saying that “it was less convinced it would provide a fitting landmark for the area“. When you keep in mind the Battersea Power Station project, we are talking about the tallest building in not only London, but also Great Britain. And the building will still be poking over the Palace of Westminster, listed as a World Heritage Site.However, Wandsworth Council has welcomed the application. 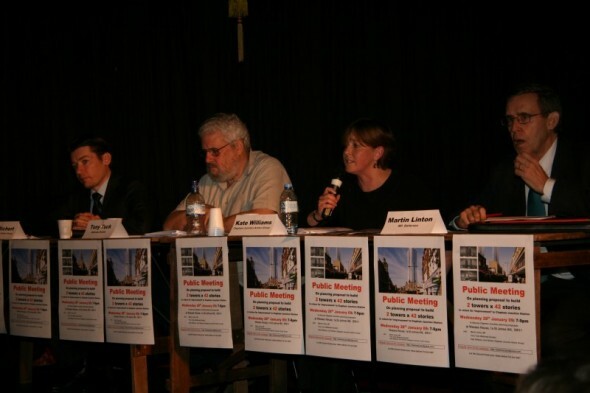 As Jane Ellison recently said, we should “now start a local discussion about the future of our station“. Is the view of the Council for Clapham Junction to become a cluster of skyscrapers? Ok, thanks for telling us in advance. So, we put that date in our agenda so far. 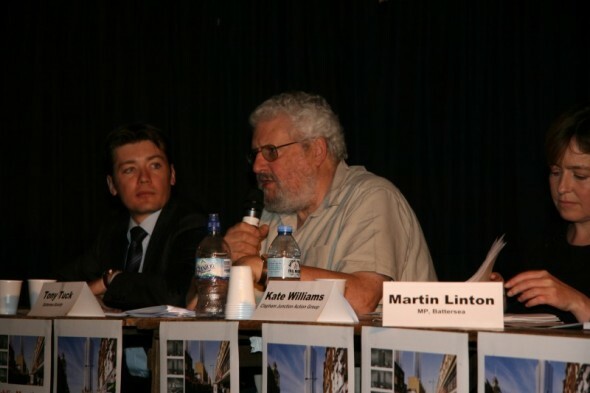 Martin Linton has called a meeting on the Battersea, Wandsworth and Putney societies on agree on the borough wide strategy on talll buildings. We welcome the initiative and support it. We look forward to see some result we will try our best to participate to the debate. “PLANS to build a 300-metre glass tower next to Battersea Power Station have been scaled back after opposition from campaigners and heritage groups.The tower formed the centrepiece of a £4billion scheme to restore and redevelop the derelict Grade II*-listed generator and the surrounding area.” (click on the article beside to read in full). The Grade II listed building was bought by Treasury Holdings a few years ago. The developers have said they have taken on board the comments made and scrapped 50 meters of the 300-metre original glass tower. Is it enough? 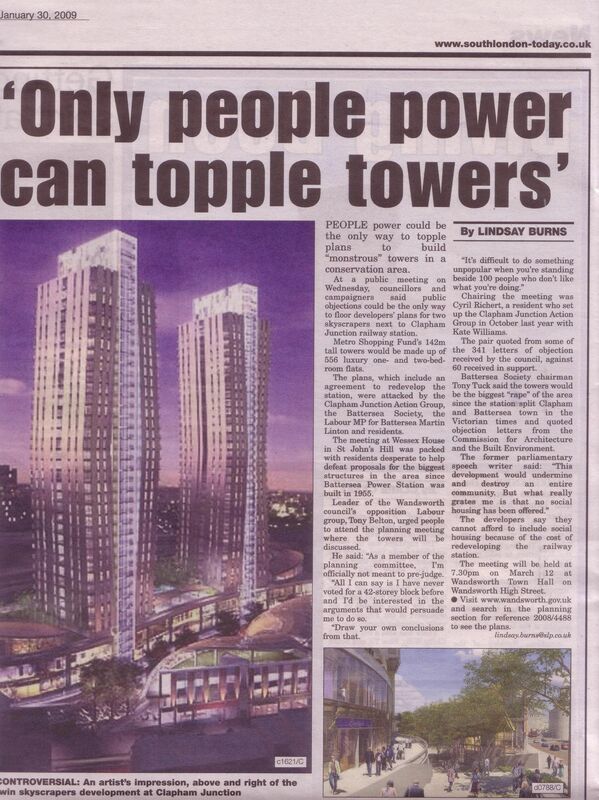 Well, it will still be 250 meters high, making it the tallest building in not only London, but also Great Britain. And the building will still be poking over the Palace of Westminster, listed as a World Heritage Site. Once again the choice is very simple, according to Rob Tincknell, managing director of Treasury Holdings, presenting the project to Boris Johnson: it is either the go-ahead for the glass tower, or the power station may be doomed. But as the architecture critic comments in the newspaper: “Is it good to build a new Tube connection to Battersea? Or to build a low energy development? Or to rescue Battersea Power Station from decay? Yes, yes and yes. Is it necessary to build a 250-metre tower to achieve these ends? No“. Why on earth are 4 of the 15 current huge tower block projects submitted in Wandsworth nowadays? Is the Council in favour of pharaonic projects and huge tower blocks? Is the Council making a policy of not spending a penny for public development and financing them all with developer fantasy? Maybe it is time for the Council of Wandsworh to clarify its policy on the issue and ask clearly its constituents their view? Isn’t this what is called democracy? Apparently, there would be another plan to be submitted to the Council to erect another tower block (about 15 storey?) 50 meters away, in front of PCS, at the bottom of Mossbury Road, for a hotel.